When a guest receives this particular pen they will be mighty impressed indeed. This pen has been designed with discretion in mind. If you simply look at this pen you would not know that this pen actually carries a flash memory drive. As a pen by itself it looks utterly appealing with a nice weight to balance ration and a polished brushed metal finish all around. This may possibly be our best looking USB pen drive that we stock to date. The most amazing thing though can be found on the top of the pen clip. A little USB memory slides out and can be further personalised with your corporate information. For a flash memory that is future looking and that can represent your brand label well, then look no further than this particular device. The item measures 14cm long and 1cm wide at the widest point. The pen function tapers off at the front, whilst the plastic clip which houses your memory drive is where your branded logo will be engraved on. The area for your logo measures on the clip 4.3cm x 8mm. This is sufficient space for either 1 line of clear text and logos or 2 lines of smaller text and logos. Having anymore than 3 lines would not be possible. Brand Area on USB measures 1.3cm x 8mm. You may also choose to brand on the pen itself too. We do not recommend it as we do not believe it will enhance the look of the product, however this option is definitely still available to you should you prefer branding on the pen itself. 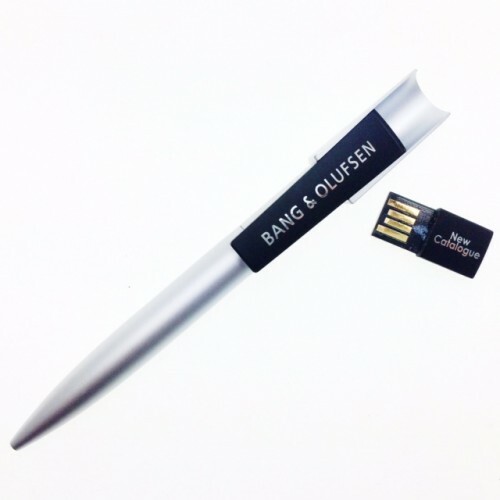 Ask us for a quote when you make your enquiry with your logo branded on the USB pen. To personalize your USB pen we would require your logo to be supplied in an EPS or PDF format saved with vector outlines. Regular jpegs may also be possible but only if they are high enough in resolution. Memory options for this usb drive are limited to 2gb only. Alternate memory sizes cannot be catered to for this particular model. Minimum orders start from 50 pieces for wholesale bulk orders. You may also order your promotional flash memory drives in a variety of capacities as well, however we require each minimum capacities to begin at 25 pieces. We deliver all around Australia in bulk to all cities and regional areas. For a quote on freight simply call us or send us an enquiry through our website. We will reply to your question within the hour during business hours.